The image below depicts a roundworm that infects humans through soil contaminated by human feces. See Common Intestinal Parasites, a Critical Images slideshow, to help make an accurate diagnosis. Ascaris lumbricoides is the largest of the common nematodes (roundworms) that infect humans. 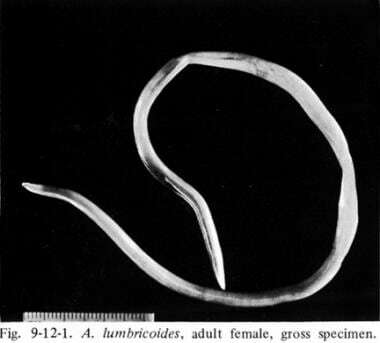 Adult A lumbricoides are white or yellow and 15-35 cm long (see first image below). They live 10-24 months in the jejunum and middle ileum of the intestine. 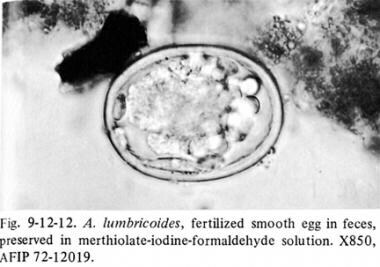 Each day, female A lumbricoides produce 240,000 eggs (see second image below), which are fertilized by nearby male worms. A Chinese study showed that 45% of infected persons shed only fertilized eggs, 40% shed fertilized and unfertilized eggs, and 20% shed only unfertilized eggs. Unfertilized eggs accounted for only 6-9% of eggs shed. Fertilized eggs released into favorable soil may become infectious within 5-10 days. Eggs may remain viable in soil for up to 17 months. Infection occurs through soil contamination of hands or food, ingestion, and the subsequent hatching of eggs in the small intestine (see third image below). 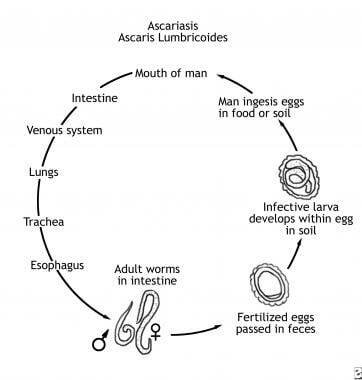 Life cycle of Ascaris lumbricoides. Second-stage larvae pass through the intestinal wall and migrate through the portal system to the liver (4 d) and then the lungs (14 d). A significant exposure may produce subsequent pneumonia and eosinophilia. Symptoms of pneumonitis include wheezing, dyspnea, nonproductive cough, hemoptysis, and fever. Larvae are expectorated and swallowed, eventually reaching the jejunum, where they mature into adults in approximately 65 days. In 1974, an estimated 4 million people, mainly in the southeast United States, had ascariasis. Recent estimates of ascariasis prevalence are unknown, but probably much lower. Immigrants from countries with a high prevalence of ascariasis comprise most recent cases. Ascariasis is most common and intensive in children, who are more likely than adults to be symptomatic. In children, intestinal obstruction caused by heavy worm burden (≥60) is the most common presenting manifestation of disease. An estimated 2 per 1000 infected children develop intestinal obstruction per year. Among children aged 1-12 years who presented to a Cape Town hospital with abdominal emergencies between 1958-1962, symptomatic A lumbricoides infection was responsible for 12.8% of cases , with 68% of those due to intestinal obstruction, usually at the terminal ileum. The peak incidence was at age 2 years in a series from Colombia and age 4.8 years in a series from Turkey. The prevalence of infection in Vietnam is estimated at 44.4%, more commonly in the northern peri-urban and rural areas of the country. In Vietnam, vegetable cultivation using night soil fertilizer places adult women at especially high risk. Children with chronic ascariasis may experience decreased growth and development due to decreased food intake. Adults with ascariasis are more likely to develop biliary complications due to migration of adult worms (see image below), possibly provoked by other illnesses such as malarial fever. In Damascus, of 300 adults referred for complications of ascariasis between 1988 and 1993, 98% had abdominal pain, 4.3% had acute pancreatitis, 1.3% had obstructive jaundice, and 25% had worm emesis. Twenty-one to 80% of patients had undergone previous cholecystectomy or endoscopic sphincterotomy. 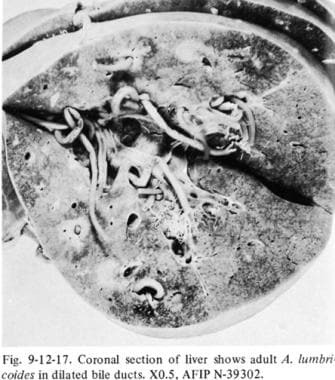 Adult Ascaris lumbricoides in biliary system. Intestinal obstruction, usually of the terminal ileum in children, is the most commonly attributed fatal complication, resulting in 60,000 deaths per year. Besides direct obstruction of the bowel lumen, toxins released by live or degenerating worms may result in bowel inflammation, ischemia, and fibrosis. Most treated patients become reinfected within months unless they are relocated to an area of significantly improved sanitation. Bethony J, Brooker S, Albonico M, Geiger SM, Loukas A, Diemert D, et al. Soil-transmitted helminth infections: ascariasis, trichuriasis, and hookworm. Lancet. 2006 May 6. 367(9521):1521-32. [Medline]. Jourdan PM, Lamberton PHL, Fenwick A, Addiss DG. Soil-transmitted helminth infections. Lancet. 2017 Sep 4. [Medline]. de Lima Corvino DF, Bhimji SS. Ascariasis. 2018 Jan. [Medline]. [Full Text]. Wright JE, Werkman M, Dunn JC, Anderson RM. Current epidemiological evidence for predisposition to high or low intensity human helminth infection: a systematic review. Parasit Vectors. 2018 Jan 31. 11 (1):65. [Medline]. Walker M, Hall A, Basáñez MG. Individual predisposition, household clustering and risk factors for human infection with Ascaris lumbricoides: new epidemiological insights. PLoS Negl Trop Dis. 2011 Apr 26. 5(4):e1047. [Medline]. [Full Text]. Hoenigl M, Seeber K, Valentin T, Zollner-Schwetz I, Krause R. Pulmonary ascariasis in patients from wealthy countries: shift in epidemiology?. Int J Infect Dis. 2012 Dec. 16(12):e888. [Medline]. Notes from the field: ascariasis associated with pig farming - Maine, 2010-2013. MMWR Morb Mortal Wkly Rep. 2013 May 24. 62(20):413. [Medline]. Peng W, Yuan K, Hu M, et al. Recent insights into the epidemiology and genetics of Ascaris in China using molecular tools. Parasitology. 2007 Mar. 134:325-30. [Medline]. Peng W, Zhou X, Gasser RB. Ascaris egg profiles in human faeces: biological and epidemiological implications. Parasitology. 2003 Sep. 127:283-90. [Medline]. Le Hesran JY, Akiana J, Ndiaye el HM, et al. Severe malaria attack is associated with high prevalence of Ascaris lumbricoides infection among children in rural Senegal. Trans R Soc Trop Med Hyg. 2004 Jul. 98(7):397-9. [Medline]. Geissler PW, Mwaniki D, Thiong F, et al. Geophagy as a risk factor for geohelminth infections: a longitudinal study of Kenyan primary schoolchildren. Trans R Soc Trop Med Hyg. 1998 Jan-Feb. 92(1):7-11. [Medline]. Dold C, Holland CV. Ascaris and ascariasis. Microbes Infect. 2011 Jul. 13(7):632-7. [Medline]. Nejsum P, Parker ED, Frydenberg J, et al. Ascariasis is a zoonosis in denmark. J Clin Microbiol. 2005 Mar. 43(3):1142-8. [Medline]. Bendall RP, Barlow M, Betson M, Stothard JR, Nejsum P. Zoonotic ascariasis, United kingdom. Emerg Infect Dis. 2011 Oct. 17(10):1964-6. [Medline]. Do TT, Molbak K, Phung DC, et al. Helminth infections among people using wastewater and human excreta in peri-urban agriculture and aquaculture in Hanoi, Vietnam. Trop Med Int Health. 2007 Dec. 12 Suppl 2:82-90. [Medline]. Halpenny CM, Paller C, Koski KG, Valdés VE, Scott ME. Regional, household and individual factors that influence soil transmitted helminth reinfection dynamics in preschool children from rural indigenous Panamá. PLoS Negl Trop Dis. 2013. 7(2):e2070. [Medline]. [Full Text]. Dunn JC, Turner HC, Tun A, Anderson RM. Epidemiological surveys of, and research on, soil-transmitted helminths in Southeast Asia: a systematic review. Parasit Vectors. 2016 Jan 27. 9:31. [Medline]. Oninla SO, Owa JA, Onayade AA, et al. Intestinal helminthiases among rural and urban schoolchildren in south-western Nigeria. Ann Trop Med Parasitol. 2007 Dec. 101(8):705-13. [Medline]. Gangopadhyay AN, Upadhyaya VD, Gupta DK, et al. Conservative treatment for round worm intestinal obstruction. Indian J Pediatr. 2007 Dec. 74(12):1085-7. [Medline]. van der Hoek W, De NV, Konradsen F, et al. Current status of soil-transmitted helminths in Vietnam. Southeast Asian J Trop Med Public Health. 2003. 34 Suppl 1:1-11. [Medline]. Das AK. Hepatic and biliary ascariasis. J Glob Infect Dis. 2014 Apr. 6(2):65-72. [Medline]. [Full Text]. Sanai Fm, Al-Karawi MA. Biliary Ascariasis: Report of a Complicated Case and Literature Review. Saudi Journal of Gastroenterology. 2007/01. 13:25-32. Shah OJ, Dar MA, Wani NA, et al. Biliary ascariasis as a cause of post-cholecystectomy syndrome in an endemic area. Dig Surg. 2004. 21(2):108-13; discussion 113. [Medline]. Saathoff E, Olsen A, Kvalsvig JD, et al. Patterns of geohelminth infection, impact of albendazole treatment and re-infection after treatment in schoolchildren from rural KwaZulu-Natal/South-Africa. BMC Infect Dis. 2004 Aug 13. 4:27. [Medline]. [Full Text]. Rodríguez Carnero P, Hernández Mateo P, Martín-Garre S, García Pérez Á, Del Campo L. Unexpected hosts: imaging parasitic diseases. Insights Imaging. 2017 Feb. 8 (1):101-125. [Medline]. Wani I. Gallbladder ascariasis. Turk J Gastroenterol. 2011. 22(2):178-82. [Medline]. Medley GF, Turner HC, Baggaley RF, Holland C, Hollingsworth TD. The Role of More Sensitive Helminth Diagnostics in Mass Drug Administration Campaigns: Elimination and Health Impacts. Adv Parasitol. 2016. 94:343-392. [Medline]. Lubis IN, Pasaribu S, Lubis CP. Current status of the efficacy and effectiveness of albendazole and mebendazole for the treatment of Ascaris lumbricoides in North-Western Indonesia. Asian Pac J Trop Med. 2012 Aug. 5 (8):605-9. [Medline]. Moser W, Schindler C, Keiser J. Efficacy of recommended drugs against soil transmitted helminths: systematic review and network meta-analysis. BMJ. 2017 Sep 25. 358:j4307. [Medline]. Steinmann P, Utzinger J, Du ZW, Jiang JY, Chen JX, Hattendorf J, et al. Efficacy of single-dose and triple-dose albendazole and mebendazole against soil-transmitted helminths and Taenia spp. : a randomized controlled trial. PLoS One. 2011. 6 (9):e25003. [Medline]. Donnen P, Brasseur D, Dramaix M, et al. Vitamin A supplementation but not deworming improves growth of malnourished preschool children in eastern Zaire. J Nutr. 1998 Aug. 128(8):1320-7. [Medline]. Galvan-Ramirez ML, Rivera N, Loeza ME, et al. Nitazoxanide in the treatment of Ascaris lumbricoides in a rural zone of Colima, Mexico. J Helminthol. 2007 Sep. 81(3):255-9. [Medline]. Shuford KV, Turner HC, Anderson RM. Compliance with anthelmintic treatment in the neglected tropical diseases control programmes: a systematic review. Parasit Vectors. 2016 Jan 27. 9:29. [Medline]. Tyagi R, Maddirala AR, Elfawal M, Fischer C, Bulman CA, Rosa BA, et al. Small Molecule Inhibitors of Metabolic Enzymes Repurposed as a New Class of Anthelmintics. ACS Infect Dis. 2018 Jul 13. 4 (7):1130-1145. [Medline]. Finsnes KD. Laryngeal spasm after general anaesthesia due to Ascaris lumbricoides. Acta Anaesthesiol Scand. 2013 Aug. 57(7):944-5. [Medline]. Hosain GM, Saha S, Begum A. Impact of sanitation and health education on intestinal parasite infection among primary school aged children of Sherpur, Bangladesh. Trop Doct. 2003 Jul. 33(3):139-43. [Medline]. Strunz EC, Addiss DG, Stocks ME, Ogden S, Utzinger J, Freeman MC. Water, sanitation, hygiene, and soil-transmitted helminth infection: a systematic review and meta-analysis. PLoS Med. 2014 Mar. 11(3):e1001620. [Medline]. [Full Text]. Gabrie JA, Rueda MM, Canales M, Gyorkos TW, Sanchez AL. School hygiene and deworming are key protective factors for reduced transmission of soil-transmitted helminths among schoolchildren in Honduras. Parasit Vectors. 2014 Aug 4. 7(1):354. [Medline]. Taylor-Robinson DC, Maayan N, Soares-Weiser K, Donegan S, Garner P. Deworming drugs for soil-transmitted intestinal worms in children: effects on nutritional indicators, haemoglobin and school performance. Cochrane Database Syst Rev. 2012 Nov 14. 11:CD000371. [Medline]. Tsuji N, Suzuki K, Kasuga-Aoki H, et al. Mice intranasally immunized with a recombinant 16-kilodalton antigen from roundworm Ascaris parasites are protected against larval migration of Ascaris suum. Infect Immun. 2003 Sep. 71(9):5314-23. [Medline]. Zhan B, Beaumier CM, Briggs N, Jones KM, Keegan BP, Bottazzi ME, et al. Advancing a multivalent 'Pan-anthelmintic' vaccine against soil-transmitted nematode infections. Expert Rev Vaccines. 2014 Mar. 13(3):321-31. [Medline]. [Full Text]. [Guideline] World Health Organization. Preventive chemotherapy to control soil-transmitted helminth infections in at-risk population groups. WHO. Available at http://www.who.int/nutrition/publications/guidelines/deworming/en/. 2017; Accessed: July 28, 2018. Olds GR. Deworming the world. Trans Am Clin Climatol Assoc. 2013. 124:265-74. [Medline]. [Full Text]. Albright JW, Basaric-Keys J. Instruction in behavior modification can significantly alter soil-transmitted helminth (STH) re-infection following therapeutic de-worming. Southeast Asian J Trop Med Public Health. 2006 Jan. 37(1):48-57. [Medline]. Bradley JE, Jackson JA. Immunity, immunoregulation and the ecology of trichuriasis and ascariasis. Parasite Immunol. 2004 Nov-Dec. 26(11-12):429-41. [Medline]. Choudhury SY, Kaiser MS. Varied presentation of biliary ascariasis and its consequences. Mymensingh Med J. 2006 Jul. 15(2):150-2. [Medline]. Cleary JD, Graham D, Lushbaugh WB, et al. Single low-dose mebendazole administered quarterly for ascaris treatment. Am J Med Sci. 2007 Jun. 333(6):340-5. [Medline]. Crompton DWT. Gastrointestinal Nematodes-Ascaris, Hookworm, Trichuris, and Enterobius. Topley and Wilson's Microbiology and Microbial Infections. 1998. Volume 5-Parasitology:561-580. Cunha BA. Antibiotic Essentials. Royal Oak, Mich: Physicians Press; 2005.
de Silva NR, Guyatt HL, Bundy DA. Worm burden in intestinal obstruction caused by Ascaris lumbricoides. Trop Med Int Health. 1997 Feb. 2(2):189-90. [Medline]. Holland CV, O'Shea E, Asaolu SO, et al. A cost-effectiveness analysis of anthelminthic intervention for community control of soil-transmitted helminth infection: levamisole and Ascaris lumbricoides. J Parasitol. 1996 Aug. 82(4):527-30. [Medline]. Hotez PJ, Zheng F, Long-qi X, et al. Emerging and reemerging helminthiases and the public health of China. Emerg Infect Dis. 1997 Jul-Sep. 3(3):303-10. [Medline]. Kakihara D, Yoshimitsu K, Ishigami K, et al. Liver lesions of visceral larva migrans due to Ascaris suum infection: CT findings. Abdom Imaging. 2004 Sep-Oct. 29(5):598-602. [Medline]. Khuroo MS. Ascariasis. Gastroenterol Clin North Am. 1996 Sep. 25(3):553-77. [Medline]. Legesse M, Erko B, Medhin G. Comparative efficacy of albendazole and three brands of mebendazole in the treatment of ascariasis and trichuriasis. East Afr Med J. 2004 Mar. 81(3):134-8. [Medline]. Maruyama H, Nawa Y, Noda S, et al. An outbreak of ascariasis with marked eosinophilia in the southern part of Kyushu District, Japan, caused by infection with swine ascaris. Southeast Asian J Trop Med Public Health. 1997. 28 Suppl 1:194-6. [Medline]. Misra SP, Dwivedi M. Endoscopy-assisted emergency treatment of gastroduodenal and pancreatobiliary ascariasis. Endoscopy. 1996 Sep. 28(7):629-32. [Medline]. Salman AB. Management of intestinal obstruction caused by ascariasis. J Pediatr Surg. 1997 Apr. 32(4):585-7. [Medline]. Sandouk F, Haffar S, Zada MM, et al. Pancreatic-biliary ascariasis: experience of 300 cases. Am J Gastroenterol. 1997 Dec. 92(12):2264-7. [Medline]. Schuster DI, Belin RP, Parker JC Jr, Burke JA, Jona JZ. Ascariasis--its complications, unusual presentations and surgical approaches. South Med J. 1977 Feb. 70(2):176-8. [Medline]. Soomro MA, Akhtar J. Non-operative management of intestinal obstruction due to ascaris lumbricoides. J Coll Physicians Surg Pak. 2003 Feb. 13(2):86-9. [Medline]. Steinberg R, Davies J, Millar AJ, et al. Unusual intestinal sequelae after operations for Ascaris lumbricoides infestation. Pediatr Surg Int. 2003 Apr. 19(1-2):85-7. [Medline]. Villamizar E, Mendez M, Bonilla E, et al. Ascaris lumbricoides infestation as a cause of intestinal obstruction in children: experience with 87 cases. J Pediatr Surg. 1996 Jan. 31(1):201-4; discussion 204-5. [Medline]. Zargar SA, Khan BA, Javid G, et al. Endoscopic management of early postoperative biliary ascariasis in patients with biliary tract surgery. World J Surg. 2004 Jul. 28(7):712-5. [Medline].